Ever since I was old enough to hold my head upright on my own, I've always been just a one-sport fan. Even as a little kid, football has been my game of choice and—as a Denver native—the Broncos and Buffaloes were my first love. So I was thrilled that arguably the best quarterback ever to play the game recently got picked up by Denver. So excited, in fact, that I've toyed with making Peyton Manning t-shirts that simply say "Elway who?". (I get a cut if you make them and get rich). But I was bummed that Tim Tebow went to the Jets in the process. I admit, Tebowmania was alive and well in my house last fall. I was doubly pleased that he seemed to be a level-headed and outspoken Christian (those two don't come together as often as I'd like in the public forum). He's also outspoken about his virginity, which made him a prime candidate for what happened a couple months ago (I know, I know, "Real current, Jared"). A website that makes a profit by facilitating affairs offered a reward of one million dollars if anyone could get Tebow to lose his virginity before marriage—or prove that it had already happened. My first response when I heard the news about the bounty this website had offered—which site shall remain nameless—was "Poor Tim! As if any guy needs more temptation, especially someone that famous!" But as I thought about it a little more, I decided it might actually be advantageous to know that behind every tempting beauty stands an entity that is only plotting your very painful (and very public) demise. So my reaction shifted quickly from "Poor Tim!" to "Lucky Tim!". After all, he's now been warned and can prepare for temptation ahead of time with the truth that there is a plot for his downfall hidden inside the temptation. And I realized something. We have all been warned and can prepare for temptation with the truth that there is a plot for our downfall hidden inside the temptation. Your pet sin may not be lust. It may be anger, jealousy, or pride. You name it. And despite what some preachers may tell you, Satan may not personally be orchestrating each of your tempting moments. Usually our own sinful nature is perfectly suited to the task. But these two are in collusion. We don't have to divide out which temptations are from our own flesh and which are from the devil. We just need to fight them with the weapons available to us through the gospel and Scripture. So we all need to be fighting temptation like Tim Tebow. 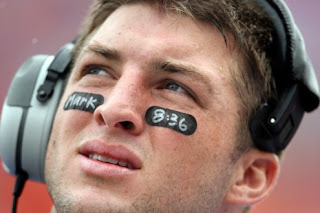 And no, I don't mean putting verses on eye black beneath your eyes. I mean being on your guard like there's a bounty on your head. I mean availing yourself of the weapons of the gospel, of the truth, and of grace. I mean walking through your day with the awareness that there is a malicious entity out there actively plotting your downfall. Because, well, there is. This article is a repost of a post that first ran on Breaking Free, the blog for Covenant Eyes Internet Accountability and Filtering software. 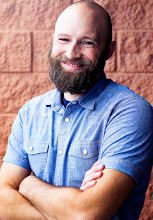 New to the Christians In Context blog? When Do We Set Aside Our Rights? The Surpassing Worth of Ice Cream? Only hours left on our latest giveaway! Do study Bibles hamper good Bible study? Gift or Giver, Which Do You Want? We're overdue for another giveaway! Is the Church Today Dying?